Derbyshire's season began with optimism and promise aplenty. But despite some impressive individual performances and occasional glimpses of what the team could achieve, they fell well short in all forms of the game. An eighth-place finish in Division Two of the County Championship was way off the aim, and they finished bottom of their T20 Blast group and seventh from nine in Group A of the One-Day Cup. BBC Radio Derby's Iain O'Brien, who played 22 Tests for New Zealand, has been commentating on Derbyshire since 2014 and looks back at the season. In the original plan, 2015 was the season Derbyshire were supposed to win promotion to Division One of the Championship. That happened quite by accident in 2012 after winning just six matches. On their return to Division Two last season, they won six and finished fourth. This year, again on high hopes, Derbyshire had a poor season, finishing second to last. They only got over the line three times, beating Gloucestershire, Kent and Northamptonshire - and failing to win a home Championship match. Those wins, it must be said, were comprehensive, giving an idea of what this team can achieve when the batting, bowling and catching all click in one game. A lack of experience in the middle and lower order has to be addressed. Alex Hughes is making impressive improvements here, but still needs more time and more support in the shape of "been there, done that" players around him before he will be a "more often than not" finisher with the bat. Decent teams don't make the same mistakes all the time and they are not yet a decent team, and are lacking consistency. They are struggling for quality. There are some very good young players coming through, particularly in the bowling with Tom Taylor and Ben Cotton, but they do need more quality. Martin Guptill, in his second stint with the county, got Derbyshire's season under way. In the second match he top-scored with a career-best blast of 227 from 176 balls and Mark Footitt's nine wickets in the match, including 6-93, helped the team notch up their first win. Wayne Madsen and Footitt again led the way with bat and bat respectively, but the team cannot rely on the same old faces. Billy Godleman was the big improver in the four-day game, going beyond 1,000 Championship runs in a season and averaging an impressive 45. Worryingly, Footitt has rejected a new contract and losing him would be a big blow. The club think he might stay but I fear he might be off, and at 29 you can see why he would think about moving on. He is one of the best bowlers in the country. It was, also, another disappointing white-ball season. An improvement on wins from last year in the T20 was a positive; although an improvement on one win in 2014 shouldn't have been too hard to top especially as they won, with Wes Durston captain, 10 of the 14 tosses allowing them to do what they wanted to first up. The team got into winning positions often, only to see their run chase stall and eventually fall awkwardly and frustratingly short. Durston also took over captaincy in the One-Day Cup. His first game in charge was against the eventual winners. 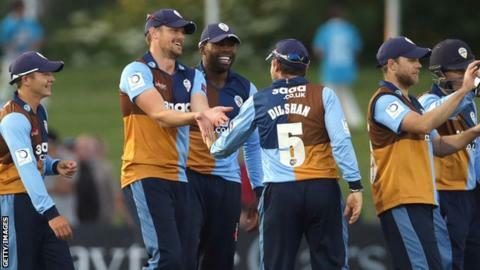 This rain-affected match was in the bag for Derbyshire, a Duckworth-Lewis revised target had Gloucestershire needing 69 from four overs, which then ended with six required from the last ball. Ball delivered, hit and caught, game over, Derbyshire win. Alas, it was a no-ball. Durston had set too many fielders on the leg side. The delivery had to be re-bowled, a free hit, and the target now was four from the last ball. Gloucestershire got it done; another one for Derbyshire from the jaws of victory. It summed up the season. Durston's season with the bat, especially in the short format, was exceptional. He so often got the batting innings off to a great start which couldn't be capitalised on. In total there were five overseas players that featured for Derbyshire this season. The two New Zealanders, Guptill and Hamish Rutherford, were the main successes. South Africa batsman Hashim Amla's stay was short but a welcome addition to the team. Sadly Tillakaratne Dilshan of Sri Lanka and Australian Nathan Rimmington were below-par with their on-field performances in the T20 Blast. The re-signing of Rutherford as the overseas pro for next season on the back of his runs for Derbyshire this season is a good move. Fellow countryman Neil Broom also joins the club as a local player (UK passport) next season, ending his hopes of playing more cricket for New Zealand. Derbyshire need more from their overseas players to improve on the season just gone. I thought they would do better this time out and I think they can make the top four next term. But I am not expecting promotion. They don't have the resources and struggle to bring in domestic talent in their prime, so are relying on their overseas signings.